On our first day of travel in Berlin, we found this huge cylindrical shaped structure with a huge text that read "The Berlin Wall - See it here". We didn't know what it was and were quite curious to see what it was so we decided and got a ticket. We expected to watch a documentary on a big screen according to what the guy at the counter informed us. 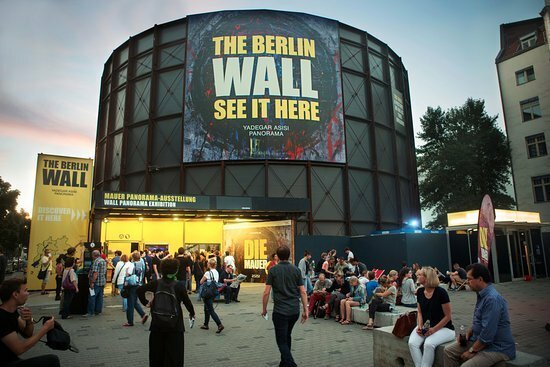 But it was more like a huge screen with a picture or art of Berlin wall showing both sides of the wall. I had to cut it in halves to be able to upload it on steemit. Any ideas how the whole thing can be uploaded as a full panorama shot? This is a panorama from the hallway as soon as you enter. There were lots of images and videos on television showing history of the wall.